Solar Panel connected to radio to make a solar radioSolar power provides advantages for remote locations where there is a need for power but no electricity available. For example, if you go to the mountains for a camping trip or to the beach for a day in the sun there are no electrical outlets to conveniently plug in to. You might want to use something as simple as a radio that runs on dc power and you can use solar power for this application since a solar panel supplies dc electrical current. Mini radios, as that shown in the photo run on batteries so are easily converted to a solar radio. Batteries will work for a day or so but if you need to use the radio for many days you would have to carry a lot of batteries with you and the cost can be very high. Also, there are people that live in areas where power is never available and they do not have an endless supply of batteries. For people that want to run a laptop computer there are commercial laptop solar panels that can be used to run the laptop or charge the computer battery. This is a simple idea that can be added to your science fair project to help demonstrate applications of solar energy. 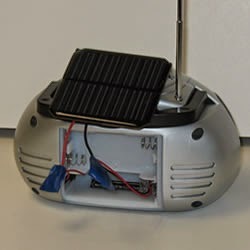 You can also use this solar powered radio as an additional demonstration and test for the science fair topics on Amount of Light that Hits a Solar Panel, Angle of Light that Hits a Solar Panel, Wavelength of Light that Hits a Solar Panel and Concentration of Light on a Solar Panel. You will need to match the amount of power delivered by your solar panel to the amount of power required by the radio. In the above picture we used a solar panel that was rated for 4.5 volts and 100 mAmps and a radio that used 4 AA batteries at 1.5 volts each and rated for 6 DC volts. We tried 2 different makes of radio rated at 6 DC volts and both worked well. You can find these types of radios for less than $10 in chain pharmacy's and discount stores. You might have to get one and just try it with a closley matched solar panel. On this project you will have to do a little discovery on your own depending on the type of radio you find and the solar panel you are using. In general, you will have to open the radio and figure out how the wiring is configured. In some cases it will be easy if there is one positive lead and one negative lead. The second radio that we converted to a solar radio was a little more complex but we were still able to fairly easily once we understood the wiring.